Food bloggers were invited once again by the generous Mr. Larry to enjoy a night of fine dining in his restaurant at Venice Piazza, McKinley Hill, Taguig. It was such a delight when asked to return to a place where food and service are all fantastic. And with that, we didn’t hesitate to answer Mr. Larry’s request and revisit his amazing restaurants – Kuse and Old Vine Grille – again! Wee! Upon arriving at the venue, under the clear starry, starry sky of McKinley Hill in Taguig, laid two long tables which were ready to accommodate us for this one fantastic night. That’s one thing that I love about this events, surprise will really surprise you. As we sat on our chairs, we noticed something. And to our delight the posters in Kuse and Old Vine Grille said that they are now offering an alfresco treat of 30% discount on all drinks and pica-pica dishes from 9:00pm onwards, Monday to Sunday. Wee! Drink til the break of dawn, nice! The first pica-pica dish that was served to us was the Marinated Salmon and Tuna Tataki. I don’t find anything special about this one. It’s good, but I found it too ordinary. You can go at any Japanese restaurants and have this one with the same presentation and taste and maybe in a more affordable price. So, I think its okay to pass on this one. The next pica-pica dish that we had that night was the Tokwa’t Baboy. Though a little pricey for its name, I assure you that you’ll like this dish the way that I appreciated it. The combination of the salty pork and the sweet flavour that the tofu absorbed from the sautéed onions, to the nice blend of vinegar, soy sauce, onion and chilli of the dip made this dish really delicious. I like how the taste played in my mouth. 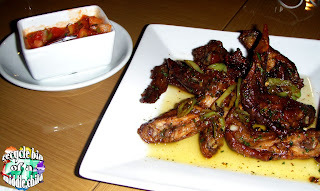 Another pica-pica dish that we had was the Buffalo Wings. The price, based on the serving, was fair enough. A group of 4 to 5 persons would enjoy munching these wings while drinking beer. The only thing that disappointed me was the term “buffalo”. Because when I read “buffalo”, I’m expecting large pieces of chicken that are really mouthfuls, but with their chicken, I didn’t see any buffalo there. Nonetheless, the taste was okay, it still be a nice partner for an ice-cold beer. This next pica-pica dish was my favourite that night – the Gambas Ala Jillo. The taste, the serving and the price were all perfect for this dish. And even if someone says to me that it is pricey, I wouldn’t mind, because the taste was really, really good. 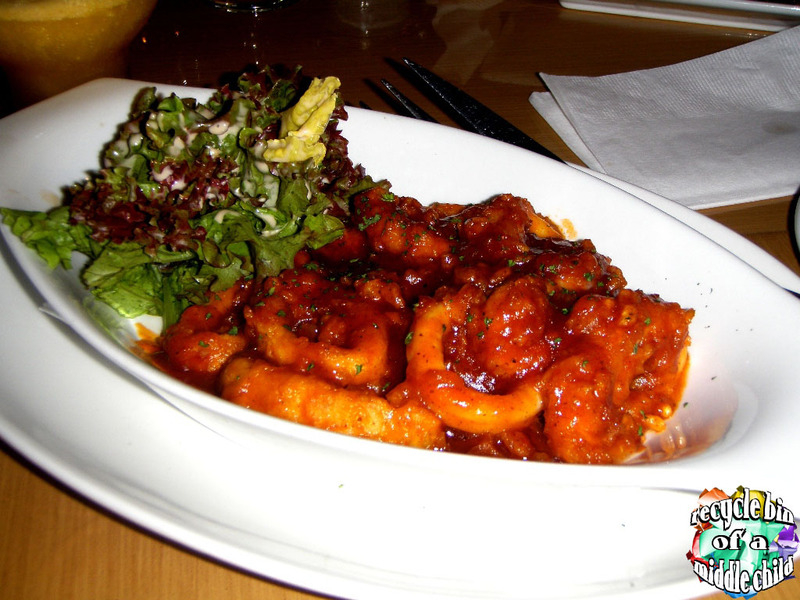 Its flavour compliments really well with the red wine that I had. 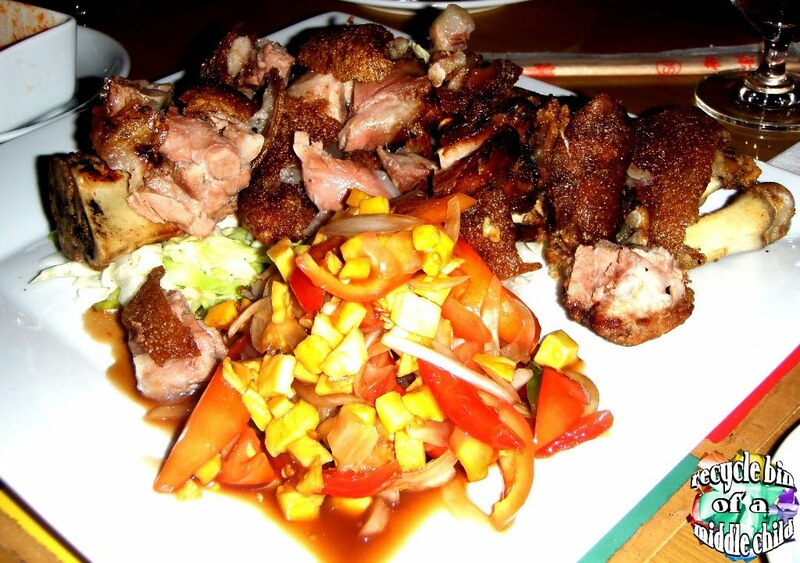 AnotherFilipino “pulutan” favourite is the Crispy Pata, and Kuse has their own All-time Favorite Crispy Pata. Served in a very big plate, this pica-pica dish can serve 5 to 8 persons, and they’ll surely chomp this one down to the bones. 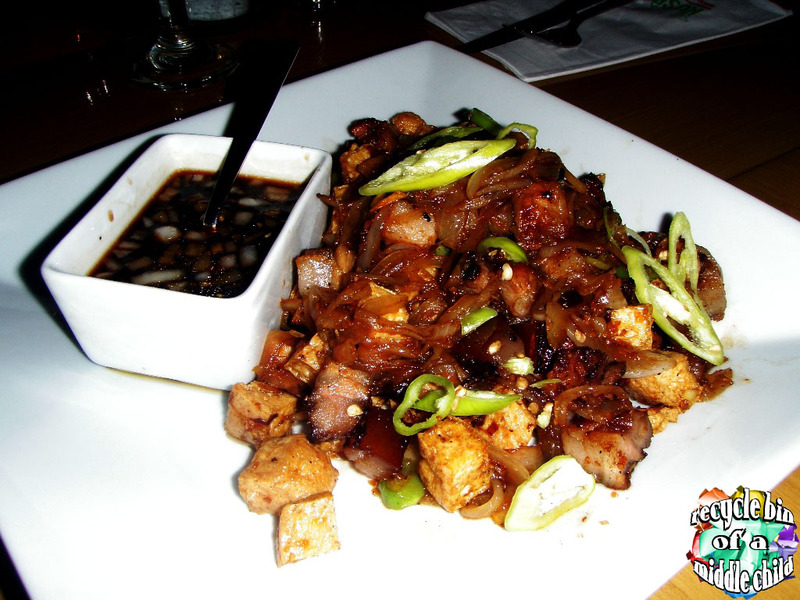 The crispy pig’s skin and the delicious salsa that comes with this dish will definitely a group’s favourite in your “inuman”. And if you’re on a really, really tight budget but still wanna unwind a little, I suggest that you have Sizzling Sisig and/or Mini Okoy with Visayan Sauce. 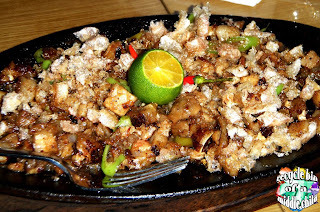 The Sizzling Sisig was good. It was like Aling Lucing’s sisig but only sweeter. I prefer the one with crushed “chicharon” on top because it adds saltiness to the whole dish, which I like! 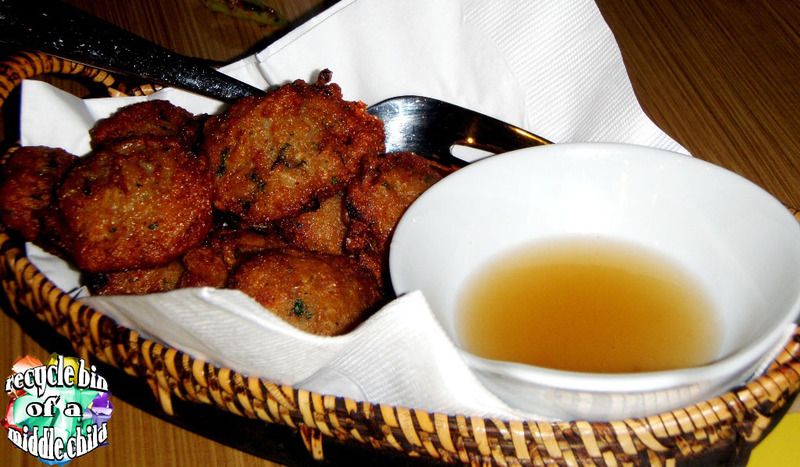 While the Mini Okoy which is one of my favourite original Filipino dishes was also yummy! 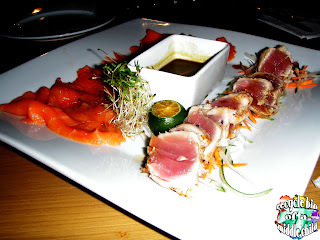 The vinegar dip made this whole dish fantastic and matched well to the “inuman” session that we had. And as the final dish came in, the challenge also tagged along. It’s about time to taste Hot and Spicy Dynamite Roll -- green pepper stuffed with chili con carne then wrapped in a spring roll wrapper. I’m not a fan of spicy food, but heck, why not try it, right? It wasn’t that spicy, and the taste was a little challenging to my palette in a very good way. I think it somehow lessen the impact of alcohol that my red wine had. 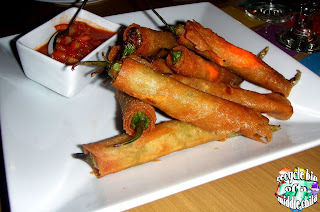 The crispy spring roll wrapper adds crispiness to the food that made it more “friendly” to eat. This dish might scare you at first but when you tried eating one roll, and then gulp some wine or beer, you’ll be surprise that you like it. Thanks to Mr. Larry, to the food bloggers and Tinay of Megaworld! Til next time, guys!